Hypotension or Low Blood Pressure – Why is it dangerous? The term hypotension refers to low blood pressure. 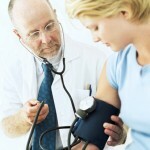 We have often heard of the dangers of high blood pressure, but what about low blood pressure? Should you be concerned if your blood pressure is too low? Low blood pressure is caused when your blood pressure drops below the level required to transmit blood through your arteries and into all the organs of your body including your brain. Hypotension is considered to occur when your blood pressure is 90/60 or lower. If you experience hypotension you might notice a few common symptoms such as dizziness, light headedness, fatigue, shortness of breath, and fainting spells. The most common causes of low blood pressure include anemia, heart disease, low-thyroid function, and drug interactions. In my opinion, the two most important factors to consider if you are often feeling dizzy or faint is drug side effects and dehydration. The elderly have a tendency to be over-medicated and under-hydrated. This situation is especially relevant when the individual is taking medication to lower blood pressure and their blood pressure becomes too low during times of dehydration. The most common drugs to cause hypotension are the drugs used to actually treat high blood pressure! The most common type of hypotension is referred to as postural hypotension. When you experience postural hypotension, your blood pressure will drop when you stand after you’ve being seated or lying down for a long time or if you have been sitting or standing motionless for extended periods of time. Normally, your body can accommodate these changes in posture by increasing your blood pressure and heart rate to compensate. Postural hypotension is normally attributed to drug side effects, heart problems, diabetes, dehydration, and excess heat. This is very common in the senior population with approximately 20% experiencing this condition. Hypotension is most commonly associated with age and drug interactions. My suggestion is that if you are over 60 years of age and are being treated with anti-hypertensive medications, have your drug dosages frequently reviewed with your doctor to ensure that you are not being over medicated for your high blood pressure. Try not to sit or stand or stand without moving for prolonged periods of time as this causes excessive blood pooling and can lead to orthostatic hypotension. Get up and move around, stretch, and take a break from maintaining static postures for extended periods of time. When you get up from a sitting or standing position, do it slowly and make sure there is a support brace available to prevent you from falling. The other issues are simply to get more physically active and maintain a better level of hydration throughout the day. Regular physical activity like cardiovascular and resistance exercises prevent blood pooling and improve venous return of blood to the heart. Adequate hydration maintains your blood volume and prevents your blood pressure from dropping too low. You should drink at least two liters of fluid per day. “Low blood pressure (hypotension)” Mayo Clinic web site; http://www.mayoclinic.com/health/low-blood-pressure/DS00590 last accessed August 19, 2013. Lanier, J.B., et al., “Evaluation and management of orthostatic hypotension,” Am Fam Physician. September 1, 2011; 84(5): 527-36. Arnold, A.C., et al., “Current concepts in orthostatic hypotension management,” Curr Hypertens Rep. August 2013; 15(4): 304-12.